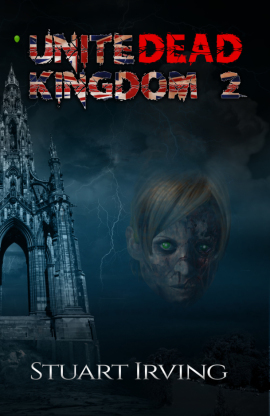 LONDON - March 6, 2018 - PRLog -- In this fast-paced sequel to his 2016 Britain-based apocalyptic zombie thriller 'UniteDead Kingdom,' author Stuart Irving's 'UniteDead Kingdom 2' delivers another powerful dose of horror and flesh-hungry zombies. Set against the backdrop of Edinburgh, Scotland, Irving's protagonist Zan McMaster leads other survivors in a race to save humanity—or at least to save what's left of it. Without missing a beat, 'UniteDead Kingdom 2' seamlessly continues from the first novel, where, in the year 2031, a violent, global zombie outbreak spreads quickly, devouring and destroying everyone in its path. As Zan and other uninfected survivors form a team and battle the undead in order to escape the same horrible fate, they also face conflict and trust issues within their own small group, threatening their ability to fend off enemies and work together for long-term survival. Irving strikes a balance between the gruesome details of the ongoing horror, and an examination of how people might react when faced with a global crisis, and real personal danger. "People should read this book if they are interested in what happens after a societal breakdown," says Irving. "People can turn on one another, and even lofty ideals or best intentions can be derailed." Struggling with hunger, dehydration, the traumatic loss of loved ones, and the truth about the scientific secrets that led to this nightmare, Irving's characters are unyielding in their desperation to save their own lives, and heroic in their attempts to save others. Crafted with dynamic plot lines, and non-stop action and suspense, 'UniteDead Kingdom 2' provides a futuristic glimpse into a world where human civilization has been forever changed. This book is for mature audiences and contains adult themes, strong language, and graphic violence. The ebook is also available at popular online retailers including Amazon.com, Barnesandnoble.com, and Apple's iBookstore. Review copies of 'UniteDead Kingdom 2' are available to media contacts upon request. Stuart Irving is available for interviews. Stuart Irving is a city professional and graduate of Edinburgh and Westminster Universities in Physics and Financial Maths. He was born and grew up in Scotland and now lives in Shoreditch, London.